You remember the meaning of KISS, right? Keep It Simple, Stupid. Prepping has gone high-tech. You can now outfit your bug-out location with a complete cadre of solar panels, deep-cycle batteries, generators, and other accouterments that will keep you in every possible comfort if the bleep were to hit the fan. Why, if you pour enough money into your prepping efforts, you hardly have to change your modern comfortable lifestyle at all. Let the other poor saps struggle to cope - you'll be living in style. Until, of course, you blow an inverter. Or run out of diesel. Or the batteries fail. If you haven't adapted to life without conveniences, you'll be in deep doo-doo if your conveniences fail. It's a whole lot easier to read about this stuff and become an armchair expert than it is to actually do stuff - and fail. My friend Enola Gay, who knows a thing or three about the harsh realities of off-grid living, wrote an excellent piece on why the most intelligent approach to prepping is the simplest. Consider the conveniences of our pioneer forefathers and embrace their wisdom and creative solutions to their basic needs. Along those lines, SurvivalBlog had an equally excellent piece called The Hard Truth about Starting Your Survival Homestead. Believe me, this writer knows what he's talking about. "I have noticed a frightening trend being used by many of the “survival seed” companies that have started up in the past several years. The same trend shows up on many “survival/ prepping” web sites. This is pushing the idea that in TEOTWAWKI one merely needs to open the bucket and have an instant survival homestead. That isn't necessarily so," he writes. "The Garden of Eden in a Bucket group would have you believe that these skills can be learned and preparations made after the fact." Let's face it, most of us didn't grow up learning homesteading or survival skills at our parents' knees. If we want to acquire the wisdom of our forefathers and their seemingly (emphasis on seemingly) effortless techniques for living a low-tech rugged lifestyle, we have to learn them the hard way. I had to teach myself to can, to milk a cow, to make cheese, to garden, and an endless list of other skills. And let me assure you I fail all the time. That's the price I pay for having grown up living a soft and modern life. But here's the thing: today, everyone lives a soft and modern life. (Well, almost everyone.) It's not meant to be an insult, it's just the truth. The dangerous part is when we think we can just effortlessly - tra la la - waltz into a pioneer lifestyle in a "bleep" situation and expect everything to be just like it is in the books. If we plant a garden, it will grow. If we get a cow, she'll be gentle, healthy, and give endless milk with hardly any effort on our part. If we buy a farm, fences will never break down and barns will never need repair and cougars will never take a calf. I encourage any and all prepping efforts, but please - please - don't think homesteading or low-tech living will be easy or trouble-free if you spend enough money or read enough books. You need to go through trials and errors and endless failures at a time when those failures won't mean the difference between life and death. I was thinking just today (while lying on my back in my dentist's chair, which is a good place to think) how hard it must have been to get around in the wintertime when there were no motorized plows. Imagine trying to get out with the milk wagon when the only way you could clear the lane was with a horse-drawn plow. Imagine the isolation of 5-6 months of being snowed in - unless you could get out with a sleigh. It's one of the things I wonder about Thomas Kinkaid paintings: Who plowed that lane? Heh. Better words were never spoken. My Mom is a wonderful lady and she lives each day for the day. My Grandmother (rest her soul) was a true child of the Great Depression (1st one). She tried to teach me to garden, can, sew, knit, etc. I had little patience or interest. Now I find myself struggling to learn to do the things I thought were passe at the time. Oh, but to have her here now to pass on the skills. I was raised a "Brady Bunch" soft person. God bless and keep you and yours, and thanks for all you do! Truer words were never spoken. My Mom is a wonderful person, who doesn't understand when I talk about prepping. My Grandmother (who was a true child of the Great Depression) tried to teach me to garden, can, sew, knit, etc. As a soft person, I thought the things were passe, that I'm struggling to learn now. God bless you and yours, and thanks for all you do! Amen to that. I love the picture of the outhouse, although the ones I have used in the past were not nearly so picturesque. There is no more bitter experience that using the outhouse in the dead of winter, and experiencing the unholy draft from out of the pit from a poorly made privy. This is one area of preparedness that needs some thought. 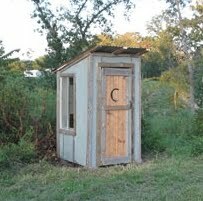 For a prepper who has a bit of property, you can dig your pit and build an outhouse, and pretend that it is a shed until such a time as it might be needed for its true intended purpose. It is well to situate it well away from the well, and yet close enough to the house that night-time visits are not impractical. Some relatives of mine built a long shed off the back door with the outhouse situated at the far end so that they never needed to shovel a path to the outhouse no matter what the weather. But the words of those who have lived with outhouses can never really prepare you for the reality. And this is true of any skill/experience set needed for survival, like the simple skill of persevering when in pain instead of reaching for pills and going to bed. Amen, Sisters! A good outhouse is a thing to behold. I wish I could tap into my grandmothers' heads at this time. The manta for me growing up was, "Study Hard and go to college." Wish I had paid more attention to my grandparents when I was growing up instead of enjoying the fruits of their gardens. Their "learn for the knowledge" drowned out the knowledge they showed by their actions. Yeah it's a hard life alright - but it's a good life.I agree less is more and low tech is best. IMHO outhouses are really a thing of the past, and except for very occasional use they are not practical for most people. Even the Amish here are moving a way from them. A low tech, Joe Jenkins type humaure sawdust or peat moss composting toilet is I think maybe a better way to go. Excellent post Ms.Patrice! I have been prepping for a while know but there is so much I still need to do and learn. The previous comments posted have hit it on the head, we never expected the good life to end. Catching up is no easy task. I pray I do not run out of time! My grandmother who died at the age of 98 taught me some lessons about survival without modern conveniences. Thankfully I not only listened, but have a good memory of most if not all of them. I remember once asking her what that pot with a cover was for, since it was stored in a cabinet in the bedroom. She told me in Acadian french that it was a p'chambre and was used during the night as a toilet that had to be emptied the next day in the outhouse. That chore was always the duty of one of the children. Because of her, I now own a scruboard and large washtub. I just wish I had her p'chambre.LOL I also have a clothesline just in case. She told me stories of how they used to preserve meat in vats of lard. There was a cistern in her back yard that collected rain water that was used for everything. I have a great respect for the generation that grew up at a time of very little convenience, but survived quite well. I only hope and pray if or when TEOTWAWKI hits we will all do as well. I dread the day when this all becomes necessary because all of you tough talkers will likely faint at the horror that has come upon you. I don't usually post comments...but, straight up, I know I'm a full-blooded American softie. I love and appreciate my flushing toilet...my LP furnace....my computer and my gas-powered vehicle. I also love that I can both support myself and save thousands of dollars a year using skills I learned from my parents: Gardening, sewing, arithmetic, and general problem-solving. And thank Heaven for that...A lot of life is just figuring it out as I go along. Isn't that how it is with everyone else? We're all just doing our best with what we have where we are. What an amusing jab at an obviously competent community. Your personal fears of inadequacy must be overwhelming you. I suspect many of the folks who come to this site have nothing whatsoever to fear. It appears many have the power of God on their side. You, on the other hand.... may need to heed some of the advice as I suspect it will be you who will quake and faint, grasshopper. Here's the bottom line...the strong and determined will survive, no matter how they were raised or what skills they've learned. This past weekend I spent my birthday learning about how the California missionaries built a dam and aqueduct to bring water to a parched San Diego from the local mountains. When the SHTF, with some ingenuity and perseverance, I know we will survive. With love and charity, maybe our less-prepared neighbors will as well. Your self confidence is no surprise Dee. I have watched confident self assured folks come and go for many years now. The one thing that they all had in common is that they truely believe they have it all covered and nothing could go wrong.I hope you are right and you can kick back and watch the rest of us go down. Good for you. By the way I forgot to mention that all of the failures were corrupt. I'm sure you are as clean as the wind driven snow.